We will pay your sales tax! Hi, I'd like to show you this page I found on Michael's Furniture Warehouse's website. Available to Order Approx 1-2 weeks. Call for details. 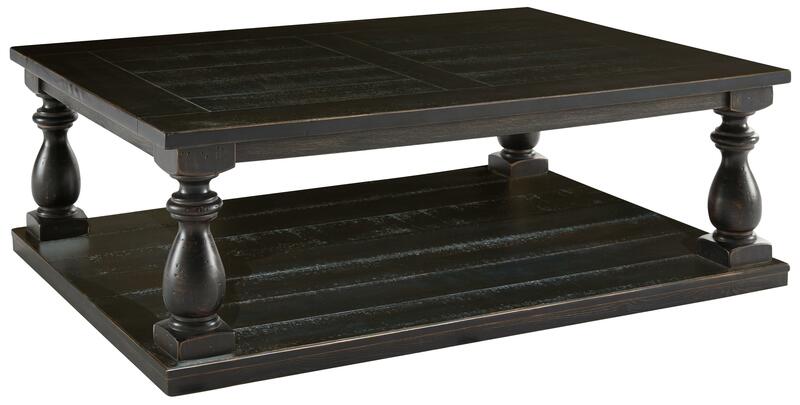 Transitional style takes on a rustic feel with this rectangular cocktail table. It features black finish thick pine veneers with wire brush and saw cut accent planks for a lived-in feel. Supported by turned posts, this table will look great in any decor style from eclectic to farmhouse. The spacious top and lower shelf provide ample space to display accents and store other items within easy reach. The Mallacar Rustic Black Finish Rectangular Cocktail Table with Turned Posts by Signature Design by Ashley at Michael's Furniture Warehouse in the San Fernando & Los Angeles area. Product availability may vary. Contact us for the most current availability on this product. 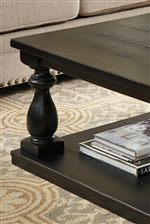 Starting with transitional turned posts, each table in this accent collection showcases rustic design with distressed pine veneers in the rich black finish. Imagine the possibilities with the versatility in storage and style for any decor for classic to eclectic to cottage. The Mallacar collection is a great option if you are looking for Relaxed Vintage Transitional furniture in the San Fernando & Los Angeles area. Browse other items in the Mallacar collection from Michael's Furniture Warehouse in the San Fernando & Los Angeles area. Michael's Furniture Warehouse features a great selection of living room, bedroom, dining room, home office, entertainment, accent, furniture, and mattresses, and can help you with your home design and decorating. View recent additions to our online furniture gallery. Michael's Furniture Warehouse offers great quality furniture, at a low price to the Panorama City, Valley Glen, Sherman Village, Burbank, Northridge, Woodley, West Hills, West Hollywood, Beverly Hills, San Fernando, Los Angeles, Woodland Hills, Van Nuys, Santa Monica, Hollywood, Glendale, Anaheim, Long Beach, Santa Clarita, Pasadena, Covina, Downey, Orange, Garden Grove, Palmdale, Oxnard, Inglewood, Pico Rivera, Norwalk, Bellflower, Lakewood, Pomona, La Puenta, El Monte, Santa Ana, Huntington Park, Torrance, Carson, San Fernando Valley, L.A. County, Los Angeles County area.